There is an enormous carpark below the casino gardens - it goes down many many levels into the bowels of the earth, with exits and entrances on each corner. This is the escalator that brings you out just by the Café de Paris. 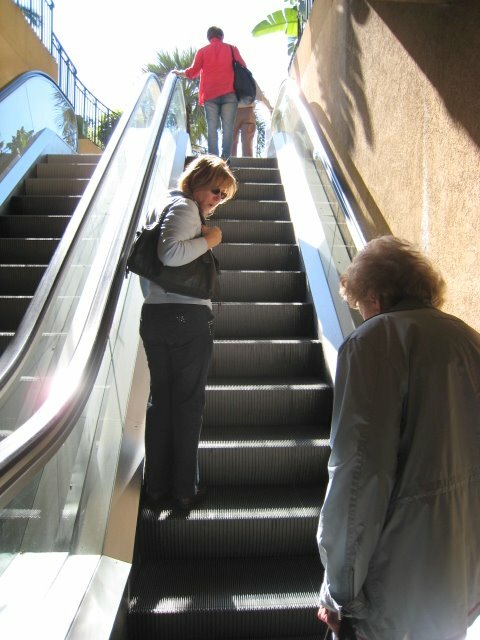 The escalator doesn't move until you step on it and then, off you go. Escalators and lifts get everything moving in Monaco - ease from one level to another - although in this case it's simply to get out of the car park. There is a beautiful indoor garden just before this moving staircase. As I've perhaps said before, all parking in Monte Carlo is free for the first hour. Would you believe, one time we drove into Monte Carlo, we found a free parking space about 200 yards from the Casino!